When the TrainingPeaks team asked me to write a blog post on climbing, I knew it was going to be a challenge. The Tour de France typically brings out an abundance of “climb like a pro” articles and posts, many sharing the “secrets” of great climbing, and I would be hard pressed to add tips or information beyond this great article by Joe Friel. There is, however, one topic I love digging into for any area of training: individualization. Do you know and understand your unique climbing physiology? When it comes to climbing, let’s face the obvious: The more power you put out per kilo of your weight (w/kg), the faster you will go uphill (assuming all other things are equal). From a training and performance perspective, training to increase your watts while managing weight is typically the most effective way to decrease your time to the top. This approach can be a one-size-fits-all solution, and we know that no two riders are the same. Is there a way to train for climbing that is designed to benefit you specifically? Yes! You can improve your climbing results by learning to understand your unique physiology and using this knowledge to plan your training and performance strategy. How? Let’s open TrainingPeaks WKO4 and take a look at the physiological demands placed on an individual rider over various types/grades of climbs. Have you noticed that there seems to be a difference in how you put out power on a flat versus a climb? Ever wonder why? One of the main culprits is kinetic energy. Simply put, kinetic energy is the energy of motion, in this case the energy contained in you (and your bike) when you’re already in motion. When you’re speeding across a flat road or competing in a time trial, high kinetic energy is already stored in your systems, and your pedaling function is really more about sustaining that energy than launching it. When you start going uphill, however, you lose kinetic energy because gravity holds you back and requires you to apply more (or different) force on the pedals throughout the stroke to maintain the same average power. This changes both the motor unit recruitment pattern and the contractile properties of your leg muscles. In other words, you make power differently when you’re climbing, even at the same average power, because the low kinetic energy of climbing requires the application of force longer or more maximal force in the pedal stroke. For some riders this results in the ability to actually increase sustained power outputs, while for others it does the opposite. It’s easy to see why understanding how climbing grade affects your power output is such a powerful tool. In WKO4 you can use analytics and the power-duration curve to analyze your past climbing performances and identify your unique power capabilities on different gradient climbs. How? The software first separates your historical data into defined bins (or ranges of specified criteria) and then generates a unique power duration model for each data bin. Take a look at the chart below. I’ve selected three unique gradient range “bins”: PDC Flat (all recorded points riding on grades less than 2 percent), PDC Grade 4 to 8 percent (all recorded points of riding on grades of 4 to 8 percent), and PDC Grade 8 percent-plus (all recorded points of riding on grades above 8 percent). This chart separates (bins) data and then develops unique power-duration curve models for each bin, estimating your power-duration relationship (how much power you can put out for a selected duration) for the select grades. These curves can be seen as the sloping, S-shaped curves. The chart uses the same data to estimate your Functional Threshold Power (FTP) for each bin. In this example of Jane Rider, we can see three different power duration curve outputs by the noted grade based on her 2016 data. Number 1 shows the estimated power duration relationship for each grade. I selected 20 minutes for this example, and we can see some pretty significant differences in her power over time at different grades. Number 2 shows her mFTP based on each data set, giving insight into her threshold at different grades. This chart gives immediate insight into grade’s effect on your power. Why is this important? First, it improves your insight into power pacing targets by identifying the effects of grade on the power numbers you can put out, which in turn helps you set pacing strategies while avoiding going into the red too early and/or too often. Second, tracking your data with this chart over time can improve your training and preparation by allowing you to specifically target a grade percent in your tracking based on your target event. Because the models in this chart are built on your own historical performance, you can see your individualized results. This gives you actionable insight into your ability as a rider and can drive training specificity to achieve success in your targeted event. How? Consider Jane Rider above. If her target event contained a longer climb over an 8 percent grade, we might focus her training on different activities than if the climb was 5 percent. What if Jane wanted to focus on time trialing? We might need to spend some time building power on the flats till she can match her climbing power. If you want even more insight, you can customize the chart to include more levels of grade. You can use this chart to track data over time and compare data from different time ranges (for example, you can compare 2016 versus 2017 or February versus March), which confirms whether you’re training effectively for your hill climb events (and by training effectively I mean progressing toward your goal). Again, let’s use the example of Jane Rider. If her target event has a longer 8 percent-plus climb, we would spend a good amount of time building her ability to produce higher power at those grades. The ability to track change in the power-duration relationship will give us immediate insight into her progress. There’s one caveat. Kinetic energy and its effects on pedal stroke and average effective pedal force is multifaceted and can be affected by other factors, such as coordination, muscle fiber type, pedaling smoothness, and perception of force. All of these factors can affect your power-duration relationship at grades, and you should consider and review all possible causes and effects as you design your training strategies. You can use this chart to tweak your pacing strategy based on the steepness and length of the hill climb feature or event you’re training for. Hill climb pacing success often revolves around two basic ideas: First, don’t start too hard. Adrenaline often fuels positive feelings on the early foothills and pitches, and it can trick you into starting too hard and blowing up later. Second, don’t go into the red too frequently. Learn where your red zone is on different gradient climbs so that you can meter out your power and finish strong. This chart keeps it simple, displaying only the grade-specific power-duration curves and each one’s resulting mFTP. To squeeze out the most improvements in your climbing performance, I suggest going deeper and reviewing pedal cadence, aerobic response, and fatigue resistance. You can find multiple charts for all of these in the WKO4 chart library. To learn more about your estimating your Power Duration Power on Grade, download a free 14-day trial of TrainingPeaks WKO4 and search the Chart Library for the “Power Duration at Grade” chart. 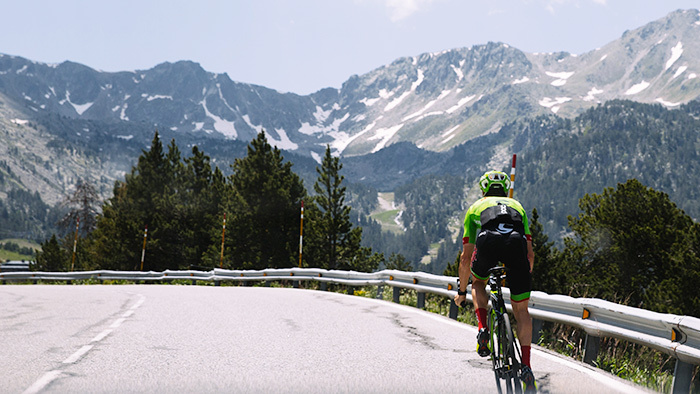 To learn more about the use of the data analytics in your training, check out this free TrainingPeaks WKO4 webinar series.